Edamame are unique soybeans that are harvested at the green stage. They are lightly boiled in water and eaten by popping the beans out of the pods. Enjoy as a snack, and appetizer, or a full meal. Children love edamame. Frozen edamame are now readily available in many supermarkets and on restaurant salad bars. Fresh edamame are increasingly found in local farmers' markets and through CSA's from midsummer through early fall. When buying from your local grocery store, ask for US-grown! With the amazing health benefits of soy, we encourage you and your customers to explore and enjoy this specialty food. Read nutrition facts. Wannamaker Seeds, a specialty crops seed business in rural Henderson County, North Carolina, was created in 1998 by Mary Jo Wannamaker. Mary Jo comes from over 4 generations of seedsmen and scientists stretching back to J.E. Wannamaker who was one of the founding members of Clemson Agricultural College. She brings scientific training as a plant breeder, knowledge of the certified seed business, and a passion for exploration of niche markets and specialty crops to the business she operates today. Wannamaker Seeds was the first seed company to introduce significantly earlier maturing onion varieties to the Vidalia growing region in Georgia. Sixteen years later, these onion varieties remain highly sought after by Georgia farmers and seed sells out quickly every year. 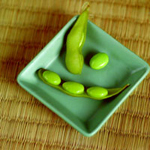 Wannamaker Seeds has also been instrumental in the introduction of edamame to the health conscious American consumer. Our varieties Midori Giant and Chiba Green are proven, dependable winners for large farmers and vegetable processors in the United States, Central America, South America, and in Europe. The interest and demand for US grown edamame continues to grow; it is now common to see edamame in the frozen vegetable sections in grocery stores everywhere. We encourage you to incorporate this heart healthy vegetable into your diet. ATTENTION Domestic & Foreign Seed Companies: We have over 15 years experience in edamame seed production. We welcome inquiries regarding custom seed production of your varieties or private labeling. Further discounts on seed pricing occur with pallet size volumes. Give us a call at 803-707-1112.